UFC 225 will descend on Chicago this weekend with a blockbuster card that includes two title fights as well as four former champions and a slew of top 10-ranked fighters in action. At the top of the card, middleweight champion Robert Whittaker will face Yoel Romero for a second time after they engaged in a five-round battle last July. Whittaker has been forced out of action since then due to injuries and illness but now he's ready to resume his career as Romero looks to avenge his prior loss to the champion. In the co-main event, an interim welterweight champion will be crowned as Rafael Dos Anjos takes on outspoken challenger Colby Covington. Former champion Holly Holm will look to get back in the win column when she takes on featherweight newcomer Megan Anderson while Andrei Arlovski looks to build on his past two wins when he faces fast rising Australian star Tai Tuivasa. In today's fantasy preview, we'll examine these fights and several more to see who has the advantage and who might be primed for an upset at UFC 225: Whittaker vs. Romero 2. Less than a year after their first fight, Robert Whittaker will battle Yoel Romero again with the middleweight championship on the line. Whittaker hasn't competed since that first fight, while Romero returned with a stunning knockout win over former champion Luke Rockhold to earn this second crack at the title. Much like the first matchup, this fight comes down to a few key factors for both athletes. For Romero, he has to be able to win rounds and control the pace rather than just looking for that one explosive knockout strike. As devastating as Romero has been throughout his UFC career, he sits back a lot and waits for the opportunity to explode forward with his most powerful strikes. Now that system has worked quite well against opponents such as Chris Weidman and Luke Rockhold, but over the course of a five-round fight that can be dangerous if that one big shot never lands. So Romero has to be able to pace himself to not only look for the knockout but also win rounds if this fight happens to go to a decision. Romero said he learned a valuable lesson from the first fight, where he exerted too much energy early and didn't have that much left in the gas tank for the later rounds. Romero's ability to put together striking combinations mixed with his world-class wrestling could be the perfect cocktail to give Whittaker problems that he didn't face the first time around. Whittaker has become a master at gauging distance on taller opponents and then forcing his way inside before unleashing a hellish combination of strikes that will typically get him the finish. Of course, Romero won't be taller, but Whittaker has to be just as wary of getting caught by one of the clubbing blows from the Cuban wrestler. That being said, Whittaker's ability to use his kickboxing from the outside and then pressuring forward with big punching combinations on the inside has been his best weapon to date and that probably won't change for this rematch. It also has to be noted that Whittaker suffered a knee injury in the opening round of the last fight thanks to a kick from Romero. If Whittaker can avoid that same fate a second time, he should be able to use his speed and power to keep Romero at range to pepper away at him for several rounds until the Cuban’s gas tank empties or he hurts him enough to get a late finish. Holly Holm will make her third appearance in the UFC women's featherweight division when she takes on former Invicta FC champion Megan Anderson on the UFC 225 main card. Anderson comes to the UFC with an 8-2 record and four wins in a row - all by knockout - and she's as legit a featherweight as there is in the sport. Anderson stands at 6-0 and definitely has to cut weight to get down to the 145-pound limit. So when it comes to size and power, Anderson will definitely have both of those on her side. As for Holm, she's got the edge when it comes to pure technical prowess, not to mention her vast experience inside the Octagon. Holm has been a champion and fought in title fights on four different occasions already. While Holm will be giving up some reach to Anderson, she's very well versed in using her kicks and jabs to keep opponents at a distance even when she's not the bigger fighter. That might not be a problem because Anderson prefers to fight in close, while Holm possesses a classic kickboxer style where she prefers to stay on the outside. The real challenge for Holm is dealing with Anderson's attempts to overwhelm her in the clinch and with her powerful Muay Thai striking game. Anderson packs a serious punch and she'll do a lot of damage if Holm's defense isn't on point. Where this fight starts to slip into Holm's favor is thanks to her grace under fire as well as her ability to slip through Anderson's defense. Anderson gets caught up in firefights too often and that's a dangerous game to play against an accurate counterstriker like Holm. If Anderson comes out like a ball of fire, Holm will have the advantage with her footwork and hand speed and then she just has to wait for her Aussie opponent to make a mistake so she can capitalize. Anderson definitely has the power to put this one away, but Holm's experience and overall technical acumen should get her the win. Former professional wrestler CM Punk will make his second appearance in the UFC this weekend as he takes on Mike Jackson in a welterweight bout on the main card. Both fighters suffered quick losses to Mickey Gall in their respective UFC debuts, but who has the advantage this time around? Punk has stayed training ever since his setback in 2016, as he looked to improve upon his rudimentary skill set under the tutelage of head coach Duke Roufus. At his heart, Punk still considers himself more of a grappler than a striker, but he definitely looked to throw a big punch when his fight against Gall first started. The real key for Punk is composure, because he was wound so tight for his first fight that as soon as the referee released him from the corner, he sprung forward with reckless aggression rather than an actual game plan. He can't do that again and expect to win. As for Jackson, he is best known for his striking prowess, where he's spent a big part of his career in boxing and kickboxing. Jackson has heavy hands and he trains with a tough group of fighters including heavyweight standout Derrick Lewis. Jackson will have a slight height and reach advantage and he'll undoubtedly look to keep Punk on the end of his punches and use a striking attack against the former pro wrestler. Punk has been under these bright lights plenty of times before but there's no doubt that the pressure on his shoulders is mounting with his second chance likely being his last if he doesn't get a win. It's also impossible to know what kind of improvements he's made since the first fight and that is a big question mark going into this matchup. If Jackson can stave off any takedown attempts from Punk and stay composed in the face of a potential early onslaught, he should be able to use his kickboxing to ultimately win the bout and maybe even get a knockout in the latter part of the fight. A heavyweight clash will headline the UFC 225 prelims when former title contender Alistair Overeem takes on fast rising star Curtis Blaydes. Overeem is returning for the first time since suffering a staggering loss to Francis Ngannou last December. Prior to that setback, Overeem had won two fights in a row, including a knockout over iron-chinned Mark Hunt. Overeem is a devastating striker in his own right, with a rich background in kickboxing, where he earned a reputation for having some of the most devastating knees in the history of the sport. Overeem has also developed a grappling game that is vastly underrated, but he is still very dangerous whenever he hits the ground. Now Blaydes will probably make it no secret what he plans to do in this fight and that's take Overeem to the ground and use his wrestling as often as possible. Blaydes averages over seven takedowns per 15 minutes in the Octagon with over 54 percent accuracy as well. In other words, Blaydes rarely goes for a takedown without landing it. That will be a huge factor in his ability to take away Overeem's best weapons, as he will undoubtedly look to shut down the wrestling and keep this fight on the feet. Overeem has displayed great takedown defense in the UFC while facing some good wrestlers in the past, including Brock Lesnar and Stipe Miocic. Plus, Overeem's knees can not only be a great offensive weapon but he can use them defensively to blast an opponent making the slightest mistake on a takedown attempt. Blaydes can't afford one error with his wrestling or Overeem will make him pay. Conversely, Overeem can't get taken to the ground early by Blaydes or he might find himself planted on his back over and over again over three rounds. Still, Overeem's ability to stop the takedown and hurt Blaydes with those knee strikes should be enough to earn the former title challenger a victory on Saturday night. Following a year out of action due to a serious knee injury, top-ranked flyweight contender Joseph Benavidez is back in action as he takes on Sergio Pettis on the UFC FIGHT PASS prelims. Benavidez has far and away been the second best flyweight in the world behind champion Demetrious Johnson ever since the division was started and it's not likely an injury is going to slow him down from maintaining that spot. Benavidez is the picture of a modern mixed martial artist, with great striking, fast wrestling and incredible submissions. Benavidez has no problem staying on his feet and trading punches with the best strikers just as easily as he can transition to a wrestling-first game plan where he'll use his grappling to win fights. Now Pettis isn't going to just roll over and play dead for Benavidez. Pettis is looking to bounce back from a loss of his own while trying to regain the momentum he had after four straight wins in a row. Pettis is best known for his lightning-quick striking game, and he's shown solid grappling defense in the past. His last fight saw Pettis out grappled by Olympic gold medalist Henry Cejudo, so there's no shame in that, but now he's taking on another explosive wrestler with a much more dangerous game on the feet. Benavidez might need some time to warm up after his long break in action, but once he gets moving, he should have the advantage in his ability to mix things up and keep Pettis guessing. Benavidez's ability to throw in a takedown or even hurt Pettis on the feet just give him too many ways to win and that's why he's a very solid pick on the undercard. As always, heavyweight fights have to come with a certain amount of forewarning that nothing is guaranteed when two behemoths are swinging at each other inside the Octagon. That being said, Tai Tuivasa is a very fun prospect to watch with devastating knockout power and a solid chin, which is always a good weapon to have as a heavyweight. Tuivasa is best known for throwing clubbing shots with his hands that do a lot of damage even when his opponents are able to play decent defense. Tuivasa is deceptively quick and definitely powerful with both hands when he's unleashing his combinations. Tuivasa lands with incredible volume and has ridiculous accuracy for a heavyweight. Now Arlovski will certainly have an experience advantage, not to mention some height and reach over Tuivasa. That said, Arlovski has struggled with power punchers in recent years and while he's managed to pick up two wins in a row, neither fighter he defeated had the kind of knockout ability that Tuivasa will carry into the Octagon on Saturday night. As long as Tuivasa doesn't allow the nerves of the big stage to get to him, he only needs one big combination to land and he'll earn his third straight knockout in the UFC. 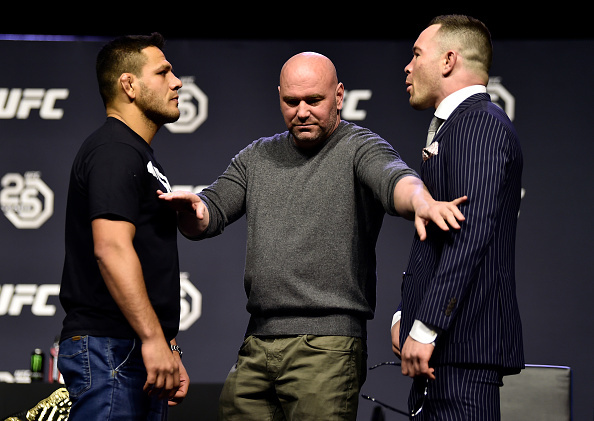 An interim welterweight champion will be crowned at UFC 225 as former lightweight king Rafael Dos Anjos takes on outspoken contender Colby Covington. On paper, Dos Anjos will definitely have some advantages in this fight, particularly when it comes to his heavy-handed striking style as well as a world-class Brazilian Jiu-Jitsu game on the ground. On the feet, Dos Anjos lands with better volume and accuracy while also showcasing slightly better defense. On the ground, Dos Anjos is a nasty grappler with a high-level submission arsenal that is nearly unmatched at welterweight if not for a guy named Demian Maia. Plus, Dos Anjos has been in enough championship fights previously to have the five-round experience necessary for a matchup like this. For all those reasons, Dos Anjos has been instilled as a slight favorite in this interim title fight. But there's one glaring weakness that Covington could be able to expose that will get him the win on Saturday night. Covington is a powerful wrestler - a former All-American at Oregon State as well as a junior college national champion - and he's transitioned that grappling pedigree to the Octagon. Covington averages just under six takedowns per fight, coupled with incredible accuracy and ground control. Covington also prides himself on conditioning, which was a staple of his run through college and he's maintained that kind of pressure and control since coming to the UFC as well. Covington's physical prowess, where he will have a big size and power advantage over Dos Anjos, will be a massive weapon in this fight. Also, it can't be discounted that the last time Dos Anjos faced a dominant wrestler was when he lost a lopsided three-round decision to future champion Khabib Nurmagomedov. If Dos Anjos gets locked on his back with Covington on top of him, he could be in for a long, miserable night.